The adaptation of the popular 1990s comic book series about a Texas man of God will be helmed by the guy who brought I Am Number Four to movie theaters this weekend. Preacher debuted in 1995 on the Vertigo label of DC Comics and ran until 2000. Jesse Custer is a drunken, um, preacher in Texas who, when he's about to address his congregation hungover, is mistakenly possessed by a half-angel half-demon named Genesis. The unnatural union of man, angel and demon, along with his girlfriend and an Irish vampire, goes on a journey to find the Christian God who abandoned Heaven when Genesis was born. 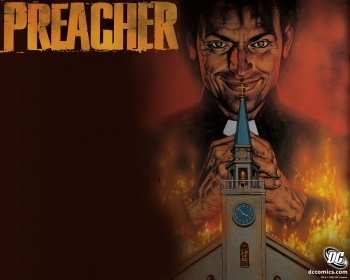 The creators, Garth Ennis and Steve Dillon, always thought Preacher would make a great movie and the project moved around from studio to studio in Hollywood until it finally landed at Columbia Pictures. Sam Mendes (American Beauty) was going to direct with John August (Titan A.E., Corpse Bride) penning the script. When Mendes left to work on the next James Bond film, there was a big hole in the director's chair. Now, that hole has been filled by D.J. Caruso, who most recently directed I Am Number Four. The thematic elements and violent nature of Preacher will make a strong contrast to the popcorn superhero flicks coming out this summer. Religion and the nature of divinity is a bit more heavy than Captain America or Green Hornet, and the idea that Jesus Christ had descendants which are protected by a powerful conspiracy called The Grail seems more like The Da Vinci Code than a comic book. Still, I think that if handled correctly by the new director Caruso, Preacher could certainly be an entertaining film that transcends what we think about comic book adaptations. Either that, or it will be complete bupkis on par with Kevin Smith's Dogma. Blech.